Greater Sydney Local Land Services has recently drafted a Landcare Strategic Plan to guide its support of, and engagement with, the Landcare community over the next five years. The plan is currently open for community consultation. Identified Landcare groups and other ‘care’ groups such as bushcare, coastcare, rivercare etc. Feedback from Landcare and Bushcare groups, Bushcare Coordinators, Landcare networks and others on the Plan is welcomed. The community consultation period closes on Monday 6 July 2015. View the GS LLS Landcare Strategy here. The GSLN committee met December 8, 2014 and decided to do a range of things, some of these are pertinent or of interest to members and potential members. Some of these activities are going to managed, explored or developed by sub-committees. 1) Judy Christie agreed to be our Chair. 2) We decided to create a newsletter and website greatersydneylandcare.org. The website would also have an online form for members. 3) A sub-committee was formed to look at benchmarking LGAs. Suggested measures by which LGAs could be benchmarked included percent of vegetation loss, grant recipients, unsuccessful grant applications, 10/50 impacts and utilities. For data, NCC’s, LLS and the National Landcare (see below). 4) National Landcare Survey might help with benchmarking. The National Landcare Survey is an Australian Government activity being rolled out by the Regional Landcare Facilitator in each region that we may be able to make work in our benchmarking exercises. 5) Grants & Funding, we will draft a check-list to help us assess requests to act as sponsor or apply for grants on behalf of groups. We agreed that GSLN will focus on the “bigger picture”. We can also act as a conduit, informing members of other grants, as well as ask people to let us know what grants they are applying for so we can help look for opportunities to collaborate or apply for larger funding sources, or link with LLS funding. We will progress the above ideas as well as look for grant opportunities for GSLN itself. 6) Data Collection, via development of an app, the app will allow data collection in the field at landcare & bushcare sites, which is in a standardised electronic format and that can also be easily shared. 7) GSLN to be a co-brand on Source to Sea in May, 2015 to reflect the new Greater Sydney boundaries. The intention is to have events on the Hawkesbury, Parramatta, Georges and Hacking Rivers paddling (or house boating) the rivers and visiting local landcare / bushcare groups culminating in a regional bushcare workshop / forum. 8) Inform Landcare NSW of our existence, our intended projects and sub-committees and ask support we might receive. The GSLN Committee will look to appointing a delegate to Landcare NSW. 9) Publish our first newsletter by Australia Day if website and membership form are ready. From the 11th to the 17th May, Greater Sydney Landcare Network’s Source to Sea is happening as part of National Volunteer Week. 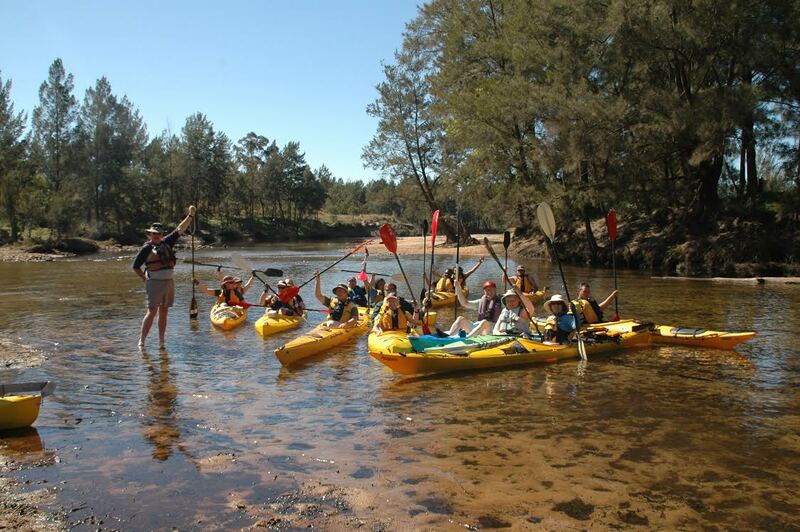 Source to Sea will include kayaking trips on the Georges, Parramatta and Lane Cove Rivers and a bike ride on the Cooks River highlighting the work of local groups and celebrating the many people who work on ground restoring our unique environment. Source to Sea events are organised in partnership with local Councils, National Parks and Wildlife Service, Landcare, Bushcare and Friends of groups.